Nora Ephron adapted two books to make Julie & Julia: My Life in France by Julia Child with Alex Prud’homme, and Julie & Julia by Julie Powell. Julie & Julia is a 2009 American comedy-drama film written and directed by Nora Ephron. 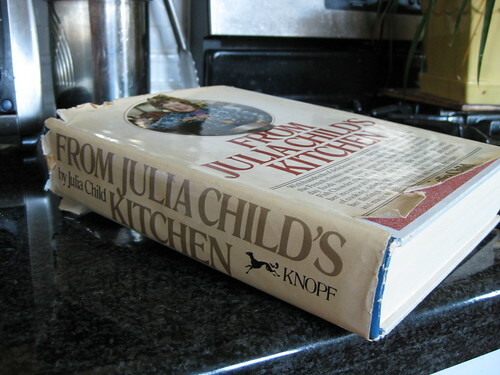 The film depicts events in the life of chef Julia Child in the early years in her culinary career, contrasting her life with Julie Powell, who aspires to cook all 524 recipes from Child’s cookbook during a single year, a challenge she described on her popular blog that would make her a published author. My biggest problem with this film is the fact that is that it spends so much (or, frankly, any) time on the “Julie” storyline. Indeed, having read Julie & Julia, I had absolutely no interest in seeing an adaptation of the collection of vacuous, self-indulgent, poorly-written blog posts by Powell which focused almost entirely on whiny hand-wringing and had almost nothing to do with Julia Child, and thus was planning to give the movie a miss. But then I found out that, despite the title, the film would also include an adaptation of My Life in France, which has become one of my favorite books of recent years. And I so I agreed to go. I didn’t love this movie as much as most people did. I did love Meryl Streep’s wardrobe, and Stanley Tucci was absolutely outstanding as the debonair and doting Paul Child. However — and I don’t say this lightly — Meryl Streep was horribly miscast. The book chronicles Julia Child’s life starting at age 36 and finishes when she is 51, not long after the publication of the first volume of Mastering. While critics and audiences have lauded Streep’s striking resemblance to Julia, it’s likely because Streep at 60 looks like the jowly, senior-citizen caricature of Julia that we knew from television (Child turned 61 at the end of The French Chef), rather than the young undiscovered adult she was during the events in the book. Ephron’s choice to cast someone a generation older than the age Julia was in the book is particularly disappointing given that it would have provided an extra level of connection between the two stories if the Julia part were given to someone younger. For an idea of just how big of a difference it would have made, keep in mind that Amy Adams (who played the Julie role) is 35 — just a year younger than Julia when she first set foot in France. The use of an actor so much older than the age of the character has other implications as well. Streep’s age vastly changes the dynamic between Julia and her husband Paul. Julia was more than 10 years younger than Paul and looked up to him as the older, wiser leader of their family. Here Streep is more than 10 years older than Tucci (who in fact is exactly the right age to play Paul). Having said all that, it’s not clear that there are any age-appropriate actors around today that could pull off the role of the thirtysomething Julia Child. And more to the point (as far as this blog is concerned) isn’t it an Oscar-worthy feat for a 60-year old to convince the audience that she is a 36-year old? On the other hand, it’s never apparent in the movie that Streep is supposed to be only 36 (at the movie’s beginning), or 39 (when she, Simone Beck, and Louisette Bertholle begin working together), or even 49 (the age Julia was when Mastering was published). The fact that her age is never mentioned make it feel a little like the film is trying to rewrite history. As much as I respect Meryl Streep’s acting, I just feel like something is not quite right here. More importantly, I don’t know that Julia would have approved. So, who will win for Best Actress? The only other performance in this category that I’ve seen is Carey Mulligan, and I would actually choose her over Streep — even though Mulligan was also playing a character several years (albeit not decades) her junior. I don’t think either of them will win though — the signs all point toward Sandra Bullock. In closing, I’ll add one more beef with the movie, which is that it makes it seem like Mastering was the pinnacle of Julia Child’s career, since its publication is the climax of the “Julia” section and its content is the backdrop of the “Julie” section. If you actually read Julia’s words in My Life in France (and I highly recommend that you do), you’ll find that Mastering was only one step in the long transformation of Julia into Julia. In fact, it was not so much the publication of Mastering that made Julia Child a household name — because, if that were the case, you’d be just as familiar with Simone Beck and Louisette Bertholle (and how many of you knew that there were co-authors anyway?). Rather, it was the advent of television in general, and public television in particular that brought Julia into the popular culture. Specifically, it was Julia Child’s passion for sharing what she’d learned about cooking technique through, as she called it, “TV teaching” on WGBH in Boston that made her a cultural icon. And while both volumes of Mastering contain lots of authentic French recipes (many from her collaborators’ families), Julia herself identified a different book as her most personal work, one she wrote by herself and specifically to be a self-contained cooking course. So if you decide you’d like Julia Child to teach you to cook (and, to be fair, Julie Powell never claimed that she wanted Julia to teach her to cook — she was just looking for a challenge and Mastering happened to be there right, as the movie would have you believe, next to The Joy of Cooking), don’t join the masses who’ve been lining up to buy reissued editions of Mastering the Art of French Cooking; instead, get From Julia Child’s Kitchen. And whatever you do, steer clear of the book Julie & Julia.